Direct Blinds is an online brand that sells high quality, made to measure window blinds. They truly are a window specialist, giving choice and variety to customers around the world. Founded in 1969, this family owned business has close to 50 years of experience dealing with the blind business, with robust products ready for the home or business. Direct Blinds manufacturer their window blind products, which gives them an edge over competitors in the blind industry. Direct Blinds own run factory produce the vast majority of the blinds. 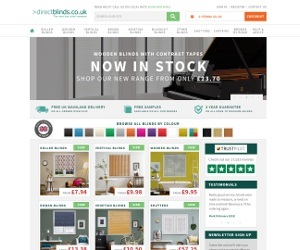 There is currently no dedicated sale or clearance page on DirectBlinds.co.uk, this means its important you look out for the latest voucher codes as discounts will be harder to find as they don’t naturally discount themselves.